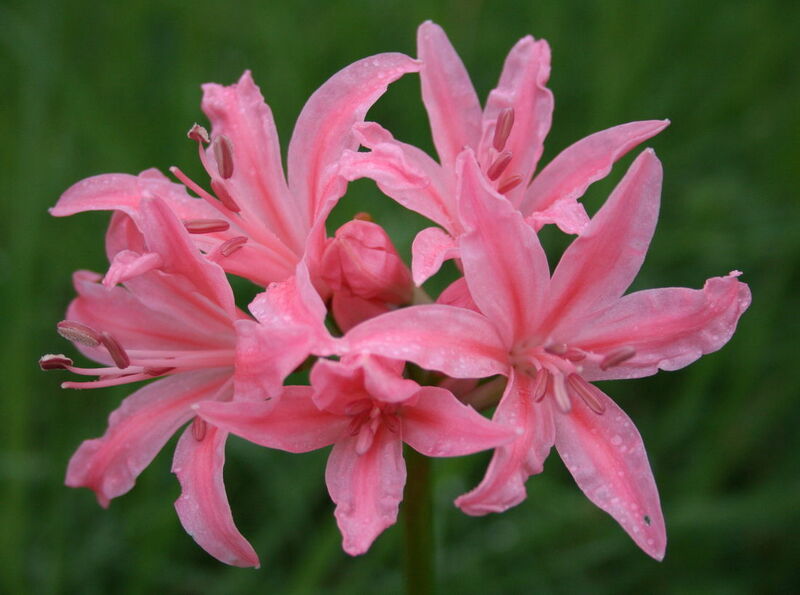 This genus from the Amaryllis Family contains about 30 autumn flowering species and all are native to South Africa, from which many modern hybrids have been breed in recent years. Despite the ‘romantic’ notion that they washed up on the shores of Guernsey in the Channel Islands, their native habitat is on and around Table Mountain in South Africa where they were discovered by Frances Masson during an expedition to the Cape in 1772. It was Amaryllis expert Rev. W. Herbert who first established the genus NERINE in 1820. It is thought they were named after ‘Nereids’ the Greek mythological sea nymphs that protected sailors and their ships. Plant the bulbs with their necks at ground level in a well- drained sunny position. Add a small amount of low nitrogen fertiliser and if available some potash at planting time. Normal Winter/Spring rains are usually sufficient, and you need to withhold water to give them a dry rest through Dec/Jan. They then need a good soak to start their flowering cycle. They can be left undisturbed for several years just top-dress end of Spring with a small amount of fertiliser and potash. They need some frost protection in the colder areas to avoid damage to the foliage.